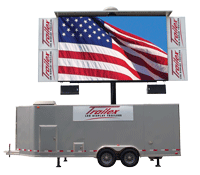 LED Display Trailer - Trailex, Inc.
Our new mobile LED display provides 16:9 HD format that extends 20' or more in the air for maximum viewing. The improved trailer is self-contained and offers 360 degree rotation for day and night-time events. This advanced design is adaptable to all OEM tiles from premium LED manufacturers. 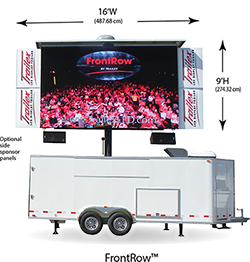 The LED Display Trailer can be built with our standard electronics package (which includes audio/visual equipment and LED tiles) or it can be customized to integrate your already existing equipment and LED tiles.